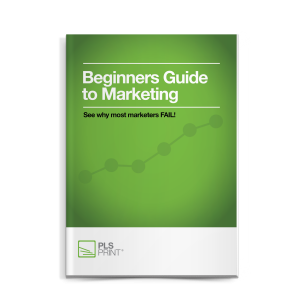 Download your FREE marketing guide! Take advantage of this free guide to kick-start your marketing. Learn the marketing basics to help you succeed in business. You will be redirected to a page where you can view and download the PDF guide. You can use the back button on your browser to return to plsprint.com. The key to any marketing success. Did we mention repetition? It takes, on average, 12 impressions for your potential customer to take notice of your marketing efforts. It's no coincidence that you can repeat many popular company slogans or phrases, and that's because the companies with household names figured out a long time ago that if you say something loud enough and for a long enough period of time, people begin to start paying attention, whether they know it or not. And it's not an accident that you remember to buy their product. They have built a sense of reliability in your mind and you begin to trust what they do. At PLS Print we can help you come up with a marketing strategy that works for your size business. Let us make sure your marketing plan has all the elements it needs to succeed. We serve our local Tampa Bay market with affordable and reliable marketing services. This is the first stage of a good marketing mix. It makes your potential customers aware that your company A) exists, and B) offers something they might be interested in. This stage could be anything from seeing a billboard of your company, seeing your company sign, or hearing about your company from word of mouth. The second stage of the marketing mix is after your potential customer has become aware of your company. You initiate a more direct approach which spurs their interest. This is accomplished nicely with a well-timed direct mail campaign. Direct mail is one of the best ways to blanket an area with information for a relatively low per-household cost. This stage may take multiple attempts to steadily increase their interest. When your potential customer begins to desire your product or service, they will be more proactive in their approach. In this stage, a direct mail postcard might spur their interest, which then causes them to go on to your website and look around. This is where your branding becomes really important, if your billboard, direct mail postcard, and website all have a consistent look, your potential customer will subconsciously feel a sense of reliability from you. The fourth step in the marketing process is when your potential customer makes a decision to contact you. This is when all of your marketing efforts blend together. Your potential customer likes what they've seen, they've visited your website and are now ready to take action and give you a call or email you. This is where your internal marketing efforts take over - your salespeople or customer service team now has their time to shine by either making a sale or scheduling an appointment. Penetrate the market with a targeted mailing. Consumers are flooded with hundreds of marketing messages every day. TV, radio, billboards, direct mail, online ads, etc. And although some of those messages will stick, many will be forgotten. So why do companies spend trillions of dollars a year on marketing? It's because repetition works. There's no 'silver bullet' marketing campaign where you do something one time and you're done! It takes repetition to drive your target audience to take action. A multi-week direct mail marketing campaign is a good tool to have in your overall marketing strategy. Let us help you determine which type of postcard campaign would work best for you. There's lot of details to consider before you spend your hard earned marketing dollars. We've spent years learning our Tampa Bay market and will use that knowledge to help you succeed.